While England was helping to spread curries around the globe through colonization and emigration, it was slowly becoming the curry capital of the world after India. How ironic for a country supposedly known for its bland foods! The first curry powders were brought to England by army officers and civil servants serving in India during the British Raj, but by all indications, curry powder production was a small, cottage industry at that time in India. Indians themselves soon came to England. After African slavery ended in the 1830s, Indians arrived in England, but not as indentured laborers as they were in the colonies. Rather, they were a relatively inexpensive source of labor and worked as ayahs (nannies), servants, and sailors. Some were students or civil servant exam takers, but no matter what their function, the Indians began to influence English food. In the 1840s, Charles Francatelli, chief cook to Queen Victoria, provided a recipe for “Indian Curry Sauce” in his book, The Modern Cook. The recipe called for “Cook’s or Bruce’s curry paste,” so it is evident that English curry products were being made by that time. 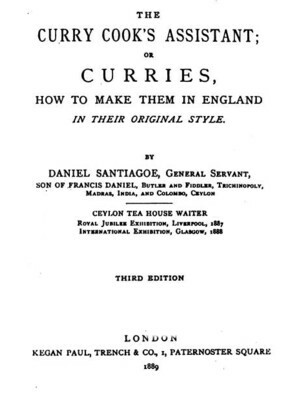 In 1889, probably the first book devoted solely to curry was published in England: Daniel Santiagoe’s The Curry Cook’s Assistant; or Curries, How to Make Them in England. According to Indian food expert Julie Sahni, the oldest curry powder factory in India, M. M. Ponjiaji & Co., was founded around 1868. She writes that their recipe is still a closely guarded family secret that has remained unchanged since the beginning of the company. The company exported curry powders extensively to England, as did other entrepreneurs. Near the end of the nineteenth century, a single dinner in India was responsible for a surge of interest in curry in England and Europe. As the story goes, an Englishman named Sharwood dined with the Maharajah of Madras and during their meal, the Maharaja mentioned a master curry maker named Vencatachellum, who sold his powder in his own shop. Sharwood later visited the shop and somehow obtained the secret recipe for what would later be called Madras curry powder: Chittagong saffron, turmeric, cumin, Kerala coriander, and Orissa chiles. When Sharwood returned to England, he had a license to import the Madras curry powder along with a pickle of fruits, ginger, sugar, vinegar and chiles–the first imported chutney. 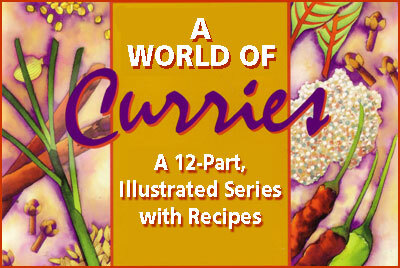 As food historian Maguelonne Toussaint-Samat recounts, “Initially sold only in the best English grocers’ shops, curry and chutney soon conquered Europe, and in 1889, at the time of the World Exhibition in Paris, the French Colonial Ministry fixed the legal composition of curry powder sold in France.” Today, the Sharwood brand owns a significant market share of the sale of Indian foods in the United Kingdom. During the heyday of the British Raj in India, roughly from 1858 to the end of World War I, Indian food became very popular in England, and its popularity reflected the English love affair with India. Mulk Raj Anand, author of Curries and Other Indian Dishes notes the “peculiar gastronomic enjoyment that curry seems to evoke in the English palate, and the warm associations which it brings into the English mind about India….” For the English army aficionados of Indian cooking, the “finishing” of a particular dish with just the right mixture of spices became a hobby, and the former officers took pride in their special blends of spices to make the perfect curry. One of the greatest proponents of curries around this time was Robert Christie. He entertained his friends at the Edinburgh Cap and Gown Club by preparing extensive, full-scale banquets from the regional cuisines of India, with a heavy emphasis on curries. There are more than thirty curries described in his section of Banquets of the Nations, published in England in 1911. Each of the recipes is individually spiced–no prepared curry powders are called for in the book. 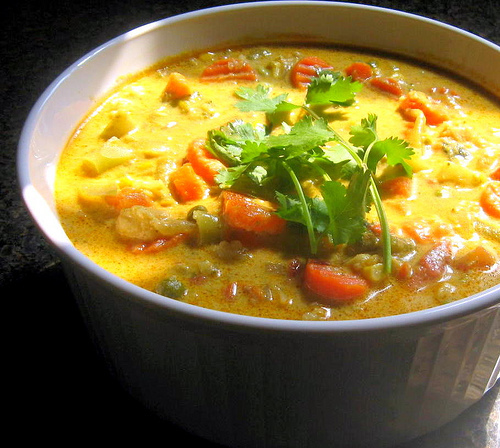 One of the English curry favorites was Mulligatawny Soup, recipe below. 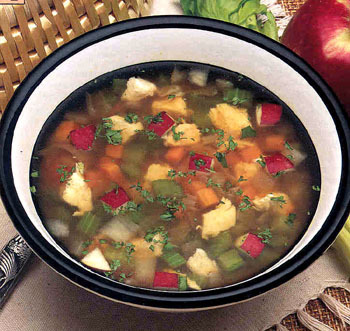 Countess Morphy, in her 1935 book, Recipes of All Nations, cites an early British cookbook writer, Dr. Kitchener, about this soup: “Mullaga-tawny signifies pepper-water. The progress of inexperienced peripatetic Palaticians has lately been arrested by this outlandish word being pasted on the windows of English coffee-houses.” There are literally dozens of different versions of mulligatawny, using chicken, veal, rabbit, and mutton as the basic meat. There was at least one restaurant in London serving curries around 1930. M.F.K. Fisher wrote in With Bold Knife and Fork that the greatest curry she ever ate was in an unnamed “famous Indian restaurant” that served curries labeled “mild” and “hot.” Fisher, having been raised in Southern California “before Mexican cooking adjusted itself to the timid palates of invaders from Iowa,” boldly said, “Oh, hot, of course.” Soon after tasting the curry, tears started streaming down her cheeks, and a thoughtful but ill-advised waiter placed a bowl of cracked ice by her bowl, “and everytime I ate a bowl of the curried whatever-it-was, I followed it with a mouthful of the temporary balm.” And temporary it was, for “the next day,” she wrote, “the insides of my lips were finely and thoroughly blistered.” The waiter should have served her yogurt, a sure-fire burn cure. In the early 1930s, letters began appearing in the Times that referred to curries, keeping the love of the subject alive. An Indian immigrant, Mulk Raj Anand, noted: “References to the files of that paper disclosed one or two other letters on the subject…. These were mainly tested recipes suggested by Englishmen and Englishwomen for the making of curry–some sensible, others totally inconsistent with the method of cooking curries in India.” Anand was inspired by the recipes’ lack of authenticity to write his book, Curries and Other Indian Dishes, published in 1932. During the 1950s there were only six Indian restaurants in all of England, but curry still held the interest of English cooks. Many cooks were influenced by Continental styles of cooking, and their curries reflected it. Curries were served at breakfast (they still are in some homes), and my Eggs Baked in Curry Sauce, below, is a breakfast dish that reflects the elegant curries of the fifties. Indian immigration picked up considerably in the late fifties, and by the time Commonwealth Immigration Act slowed immigration in 1962, more than 100,000 Indians and Pakistanis had entered England–the first large-scale emigration to England from the Indian subcontinent. By 1991, the total population of Indians, Pakistanis, and Bangladeshis in the U.K. had exploded to one and a half million. “With this immigration came their infrastructure,” explains England’s Pat Chapman, founder of The Curry Club. “Their families came over, they brought their foodstuffs, and very shortly they were opening restaurants on the back streets.” The appearance of Indian restaurants in the U.K. coincided with the beginning of a dining out tradition among the middle class, which had never developed during the war years and the austere fifties. “We had never experienced anything like this,” Chapman adds. “The food was very, very tasty–and exotic.” The food was also relatively inexpensive, and dining out at a curry restaurant soon became one of the most popular social activities in the U.K. As the Indian population grew, the number of restaurants increased, which coincided with the trend toward dining out. 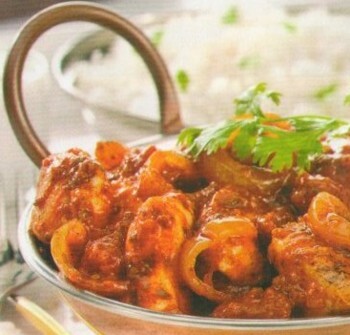 By 1991, there were 7,000 curry restaurants in the U.K. and 1,500 in London alone. In 2000 there were 8,500; 85% are Bangladeshi-owned (over 7,000) and staffed with mainly Bangladeshi personnel. 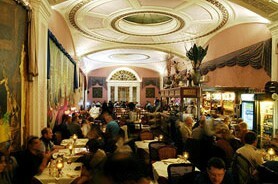 In fact, England now has, after India, the largest number of Indian restaurants of any country in the world! It should be noted that the word “curry” in the U.K. is used interchangeably with “Indian food,” so a curry restaurant means an Indian restaurant. These restaurants serve a variety of Indian foods but they are judged by the quality of their curries. 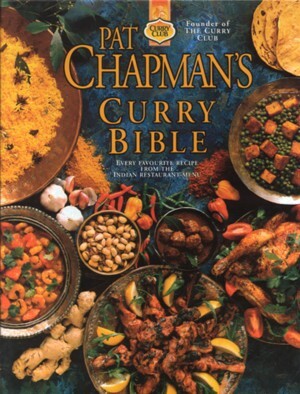 Pat Chapman has played a major role in the immense popularity of curries in the U.K. His grandfather had been in the British Army in India, and moved back to England when he retired. He his passion for Indian was passed on to Pat, who was “weaned on curries” during the fifties at those original six Indian restaurants, and cooking curries became his passion. When Mary Jane and I took his culinary tour of India in 1996, Pat managed to find his grandfather’s house in Agra, and met with the current owner, who showed him the original deed with his grandfather’s name on it! 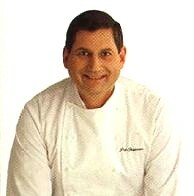 Pat turned his passion for Indian food into a business when he founded The Curry Club in 1982. Soon, Pat became the King of Curry, ruling over a curry empire that included a membership of 13,000, a quarterly magazine, mail order company with dozens of curry products, a guide to the top 1,000 curry restaurants in the U.K., and numerous curry cookbooks in print. Since that time, he has published so many books on curry that I’ve lost track of the titles, which have sold more than a million and a half copies. Visit Pat on his website, here. There seems to be no end in sight for the popularity of curry in the U.K. 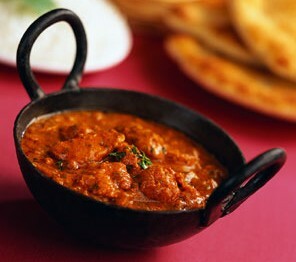 The number of curry restaurants is projected to top 10,000 by the year 2010. In 1990, two and a half million households cooked curry at home at least once every two weeks, a rise of eighty percent since 1983. Indian food accounted for fully half of the ethnic food market in the U.K. Interestingly enough, the surveys that produced the above figures also came up with an interesting statistic about the supposedly bland-loving Brits: only about five percent of the people surveyed liked their curries mild; the remainder said they liked theirs hot or medium-hot. Next comes Korma, Koorma, Kurma. Pat notes: “In India, Korma refers to a slow-cooking style, where only ghee or oil (and no water) is used in the initial cooking with garlic, ginger and onion, to which lamb marinated in youghurt is added. Balti is the third most popular curry and supposedly its obscure origin is from Baltistan, a region in northern Pakistan near Kasmir. As Pat describes it: “Birmingham’s white population made Balti their own and in the 1990s, Balti spread rapidly all over the U.K. and beyond. This recipe from England illustrates a refined use of curry that was popular during the 1950s. Use egg molds to make certain that the eggs have eye appeal and serve this dish for breakfast or brunch accompanied by a rice and chutney of choice. Add the jelly or jam and the lemon juice and simmer for five minutes. Add the tomato, stir well, cover the pan, and remove it from the heat. 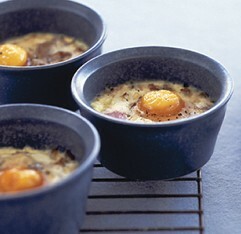 Place greased ramekins on a baking rXK and carefully break the eggs into them. Top each egg with curry sauce. Place the molds in the oven and bake for 8 to 10 minutes at 350 degrees F. Do not overcook. Heat any additional curry sauce and serve it on the side,to be added to the eggs as desired. There are so many versions of this dish that the total number of possible ingredients probably tops fifty. Charles Baker, writing in The Gentleman’s Companion, described his version as: “More Often Is Actually a Stew & Not a Soup; which Is a Curry, yet Not Strictly a Curry; Is Made of Fowls, Coconut Milk, Herbs, Curry & Lentils.” My version lacks lentils, and also lacks some of the ingredients suggested by other cookbooks: mushrooms, turnips, ham, and oysters. Some recipes add a little cream at the end to thicken the soup; others suggest squeezing a whole lemon or lime into the soup. In a large kettle, combine the chicken, carrot, onion, celery, thyme, bay leaf, parsley, mace, cloves, and chicken stock. Bring to a boil, then reduce the heat and simmer, uncovered, for one hour. Strain the mixture, reserving the chicken and the broth. Place the broth in the freezer. When it has cooled sufficiently, skim the fat off the top. Remove the chicken from the bones, remove the skin, and mince the meat. Heat the butter in a soup kettle and saute the apple and onions until the onions are soft, about 5 minutes. Stir in the flour, curry powder, and cayenne and continue sauteeing for 3 more minutes, stirring often. Add the reserved broth and the coconut milk, bring to a boil, then reduce the heat and simmer, uncovered, for fifteen minutes. Remove from the heat and strain the soup through a fine sieve. Return the soup to the heat and add the reserved chicken. Simmer gently until the chicken is heated through, about 5 minutes. Place 1/2 cup of rice in the center of each of 4 soup bowls. Pour the soup around the rice and serve. 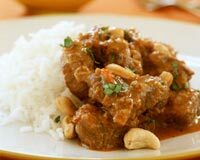 This recipe, courtesy of Pat Chapman, appeared in “The Curry Club Magazine” in an article about the Gurkhas, “the world’s most natural of fighting men.” It is interesting because it is one of the few curry recipes I uncovered that depends on cashew nuts. In a food processor, combine the cashews, chiles, ginger, cinnamon stick, cardamom seeds, cloves, garlic, poppy seeds, coriander seeds, cumin seeds, and turmeric, with the water and puree into a smooth paste. Heat the ghee in a large skillet, add the onions, and fry to a golden brown, about 8 minutes. Stir in the cashew-curry paste and the yogurt and cook over medium heat, stirring often, for 5 minutes. Add the lamb, stir it coat it well, then cover the skillet and cook the lamb over low heat for 20 minutes. Remove the cover and add 1/4 cup of cilantro. Stir, recover, and cook over low heat for 10 minutes. Remove the lamb to a heated serving dish, sprinkle with the remaining cilantro, and squeeze the lemon over the dish. British Foreign Secretary, Robin Cook commented: “Chicken Tikka Massala is now a true British national dish, not only because it is the most popular, but because it is a perfect illustration of the way Britain absorbs and adapts external influences. Chicken Tikka is an Indian dish. The massala sauce was added to satisfy the desire of British people to have their meat served in gravy.” There are dozens and dozens of recipes for this dish, but this one is typical. Note: This recipe requires advance preparation. In a large bowl, combine all the ingredients for the chicken except the chicken and melted butter and mix well. Add the chicken and marinate overnight in the refrigerator. The next day, allow the chicken to come to room temperature and preheat the oven to 350 degrees F. Bake the chicken for 8 minutes, basting with the butter twice. Drain the excess marinade and bake for another 2 minutes. Turn off the oven but don’t remove the chicken. To make the sauce, heat 4 cups of water in a pot and add the tomato paste, tomato sauce, chopped tomatoes, ginger, garlic, green chiles, chile powder, cloves, and cardamoms and cook over medium heat until reduced to a thick sauce. Strain the sauce, adjust the salt, and return it to the heat. Bring to a boil, then turn off the heat. Add the butter, cream fenugreek, and ginger and stir. If the sauce tastes too sour, add honey to taste. On each plate, serve the chicken and spoon the sauce over it. Traditionally this korma dish is served over steamed white rice, but for a nice variation I like to serve it over rice pilaf with nuts such as chopped cashews. Serve it with a yogurt salad too, such as raita in part 3 of this series. Using a mortar and pestle, pulverize the fennel seeds and poppy seeds. Set aside. In a blender, puree the garlic, ginger, half the onion, half of the bunch of cilantro and the serrano chiles. Set aside. In a large pot, heat the tablespoon of butter or olive oil and saute the remaining onion until golden brown. Pour in the pureed mixture and fry for about 2 minutes, stirring constantly. Add the turmeric and fry for about another minute, then add the ground fennel and poppy seed mixture and fry for 2 more minutes, stirring constantly. Add the quartered tomatoes and cook on low heat for about 10 minutes. Add the rest of the cilantro, coconut milk, yogurt and vegetables. Cover the pot and cook the until the vegetables are slightly firm and not soft. Serve over steamed rice or pilaf. Most cooking authorities now believe that this dish is named for the pot with the circular handles that it is served in, regardless of whether it originated in Baltistan or Birmingham. As with most British curries, there are endless variations on balti. Any meat can be used, or chicken. Which ever you choose, it should be cut into small chunks and browned in vegetable oil first. Heat the oil in a large saucepan over moderate heat. Fry the onions, ginger and garlic until the onions are translucent, about 3 minutes. Add the tomato and fry, breaking it up with a spoon. Pour in the water and the remaining ingredients except the meat and cilantro. Bring to a boil, then lower the heat, and cover the pan. Simmer for 30 minutes. Remove from heat and allow to cool, then transfer to a blender and liquefy it. Pour in back into the saucepan, add the meat, and simmer until the meat is tender, about 30 to 45 minutes, less for chicken. Serve in a balti pot (if you can find one) garnished with the cilantro.